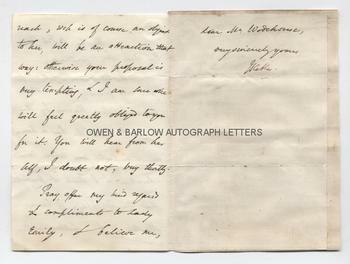 JOHN KEBLE Autograph Letter signed. British (English) churchman, poet and founder of the 'Oxford Movement'. ALS. 3pp. No place. Thursday, 18th February 1855. To "My dear Mr. Wodehouse". 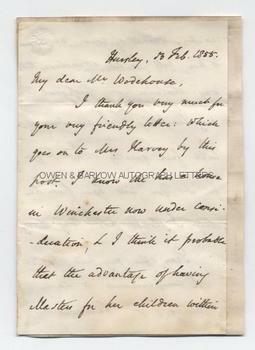 "I thank you very much for your very friendly letter: which goes on to Mrs Harvey by this post. I know she has a house in Winchester now under construction, and I think it probable that the advantage of having Masters for her children within reach, which is of course an object to her, will be an attraction that way: otherwise your proposal is very tempting, and I am sure she will feel greatly obliged to you for it. You will hear from her self, I doubt not, very shortly. Pray offer my kind regard and compliments to Lady Emily," etc. 12mo. Approx 5.25 x 3.5 inches. 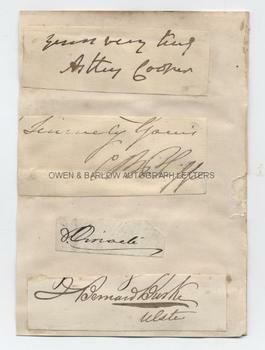 Laid down by blank verso of last leaf to part of an old album leaf with the clipped signatures of Benjamin DISRAELI, the surgeon Sir Astley Paston Cooper, the genealogist Sir Bernard Burke and the soldier Charles Beaumont Phipps. In very good condition. John Keble was, perhaps, the most popular and certainly the highest selling poet of the 19th century but it is as a churchman and, in particular, as one of the leading lights (with John Henry Newman and Edward Pusey) of the Oxford Movement that he is best remembered. After retiring from the Chair of Poetry at Oxford in 1841, John Keble spent the remainder of his life as a parish priest at Hursley in Hampshire, where he was a neighbour and influencer of the novelist Charlotte M. Yonge. John Keble continued to write and to exercise a vast spiritual influence upon his generation. Keble College Oxford was founded in his honour. The Mr Wodehouse to whom he is here writing is probably the Venerable Charles Nourse Wodehouse, Bishop of Norwich and "Lady Emily" is probably Wodehouse's daughter, Emily, who married William Legh, 1st Baron Newton. From a 19th century album compiled by the Marryat family, relatives of the novelist Captain Frederick Marryat, author of Mr. Midshipman Easy and Children of the New Forest, etc.